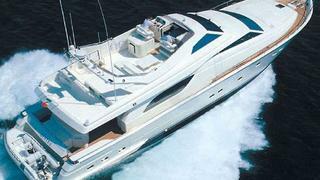 Costis Pontifex at Ekka Yachts gets in touch to say he’s sold Anastasia, a 24m Ferretti raised pilothouse motor yacht. Built in 2002, Anastasia accommodates eight guests in a master suite, VIP stateroom and two twin cabins while twin 1420hp Caterpillar engines give her a cruising speed of 27 knots. Anastasia was asking €1.2 million.